Event Description: An gorgeous site for a corporate team building event, the Prado has it all. When naming the world’s most important art museums, one must certainly put the Prado, alongside the Louvre, at the top of the list. 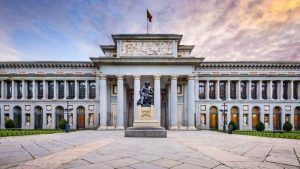 Location History: One of the world’s first public art galleries, the Prado dates back to 1819, when king Fernando VII created the Royal Museum of Painting in an attempt to house Spain’s considerable artistic wealth under one roof. With the disappearance of the monarchy, the museum became national property and established permanent residence in the Villanueva Building, near El Retiro Park. Although no one could possibly see all of the Prado’s 9000 paintings in one day (many are in storage due to lack of sufficient exhibit space), your treasure hunt in the Prado will take you on a tour through the history of Spanish, Italian and Flemish art. During your corporate team building treasure hunt…expect to examine the unexpected details of works by Brueghel, El Bosco, El Greco, Velazquez, Goya and many others, including a few surprises.